Artist's rendering of the private Dream Chaser space plane built by Sierra Nevada Corp. in orbit. A commercial spaceflight company will launch the first orbital test flight of its private space plane Dream Chaser in 2016, a unmanned debut mission to prove the spaceship is capable of flying astronauts on round-trip flights into space. The Dream Chaser space plane, buit by Sierra Nevada Corp., is scheduled to launch from Cape Canaveral, Fla. on Nov. 1, 2016, atop a United Launch Alliance Atlas 5 rocket, the company announced Thursday (Jan. 23). "We expect to have a fleet of these vehicles, much like the shuttle with different purposes," Mark Sirangelo, corporate vice president and head of Sierra Nevada's Space Systems, said in a news conference today (Jan. 23). "Some will be all crew, some will be crew and cargo. Some will be cargo, some will be servicing, and we also think that at some point there will be independent science ability with the vehicle. It's a multiuse vehicle, we like to think of it as our 'space SUV' and we're very proud of it." Sierra Nevada officials also plan to use the Operations and Checkout facility at NASA's Kennedy Space Center in Florida to prepare the reusable Dream Chaser vehicle before and after its flights. NASA's deep-space Orion spacecraft — designed to fly astronauts to deep space destinations — is currently being built and tested in the facility as well. This artist's illustration depicts a Sierra Nevada Corp. Dream Chaser space plane poised for launch atop a United Launch Alliance Atlas 5 rocket from Launch Complex-41 at Florida's Cape Canaveral Air Force Station. The first test flight is slated for November 2016. With the retirement of NASA's space shuttle fleet in 2011, the space agency is depending on companies like Sierra Nevada to eventually fly U.S. astronauts to and from the International Space Station. Currently, NASA must buy seat on Russian Soyuz space capsules to ferry American and U.S. partner astronauts to the station. 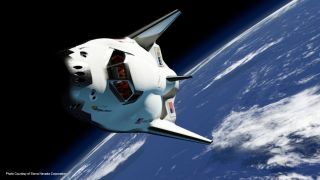 Sierra Nevada is one of several companies developing private manned spacecraft for astronaut flights with support from NASA's commercial crew program. The other spacecraft under development include SpaceX's Dragon space capsule, Boeing's CST-100 space capsule, and the secretive company Blue Origin's Space Vehicle. Dream Chaser still has two years of work ahead of it before its first orbital flight. Officials with Sierra Nevada plan to fly the space plane out at Edwards Air Force Base on at least one more autonomous test, after which it will be fitted with an ejection seat before flying crewed atmospheric tests, said Steve Lindsey, program manager for Sierra Nevada Corporation Dream Chaser. The November 2016 flight will be an autonomous, uncrewed orbital flight that will probably last about one day before landing on the U.S. West Coast, Lindsey said. "The vehicle [flying in 2016] will be basically identical to the vehicle that we will fly about a year later when we put crew on it," Lindsey said. "Our intent is to have all of those systems and subsystems onboard and checked out and use this on the path to certification for the orbital crewed vehicle." In 2013, Sierra Nevada performed its first free flight of the Dream Chaser that tested the spacecraft's automated approach and landing system. While the test flight went smoothly, the spacecraft skidded off the runway after a malfunction prevented its landing gear from deploying properly.